Enjoy semi-professional men's soccer in San Ramon! Our home games will be played at 3 different locations during the season. The March 23rd at Rancho San Ramon Community Park will be free (donations welcome) for everyone. Tickets for the March 30, April 13, May 11, and June 15 home games will be $10 a piece. For all home games, children ages 5 and under are free. Also, for all home games, San Ramon FC youth players will receive free admission by wearing their 2018 or 2019 SRFC soccer jersey! We are selling an NPSL Season Tickets Package to all of our home games for $40. All orders for season tickets will include our FIRST EVER San Ramon FC scarf! It's our way of saying thank you for supporting local soccer in our community. 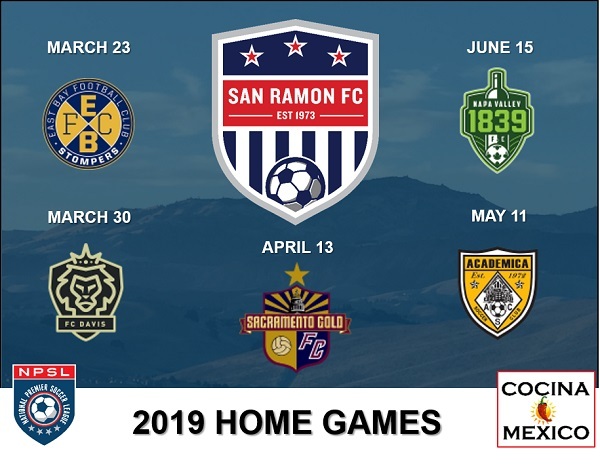 For season tickets information, please email npsl.tickets@sanramonfc.com.